It was a lot of fun arranging and rearranging the blocks. There are blocks in this quilt from old friends that I've known for many years and new friends that I have met through blogging. I machine quilted this quilt on my Bernina. I love doing this leaf quilting pattern to fill in a border. I hope you are having a good weekend and finding a few minutes to do some stitching!!!! I'm editing this post so that you all know that this method of making continuous bias binding was not my original idea. I found a tutorial on one of the quilting self help sites, and followed it step by step and came up with this. Actually I ended up with 2 of these "hats".....so I wrote my own tutorial. This is not the traditional way of making continuous bias binding, but I always seem to get the triangles of fabric in the wrong place. So here is a tutorial of a method that I found to make continuous bias binding that I think is quick and easy. I first bought a 3/4 yard of fabric. You need to begin with a square. My square is 27". Now you can turn your sewing machine off. This is all of the sewing you need to do. Draw a diagonal line from one corner to the other. You just need to clip enough in order to be able to get your scissors in between the fabric layers. Now flip the square over and repeat the last step on the opposite corners (the ones that are NOT clipped yet). After you've drawn this line, clip these two corners. Carefully cut on the lines being sure to cut the layers separately. Now pick the fabric up and form it into a tube. Press the seams. Now draw lines on the tube the width of your preferred binding. But, don't draw these lines all the way to the top....stop about 6 inches from the top of the tube. This is a better photo. With your rotary cutter cut the binding strips stopping approximately where you see the line in the photo below. Now pick up the tube and rotate it until the uncut portion is centered on the cutting mat. Draw lines to connect the strips on the bottom with the next one diagonally on the top as shown in the photo below. Next cut on these lines with scissors. That step is hard to explain but hopefully the picture will help explain it. Press the binding in half. From 3/4 yard of fabric I ended up with 8 yards 7 inches of binding. Below is bias binding that I made from a yard of fabric. The piece at the left is left over from cutting the square and can go in my scrap bin. The little pile in the middle is all of the waste from making the binding. I really like this method and hope you will give it a try. I've been machine quilting another UFO. As soon as I get the binding hand stitched, I'll post a photo of another finish. This is continuous bias binding, and I found a quick and easy way to make it. I'm working on a tutorial to post in a day or two so you can see how to make it step by step. I really like making bias binding from striped fabric because it looks like the stripes wrap right around the edge of the quilt. I started with a 36" square of fabric. I cut my binding at 2 1/4" wide, and I ended up with a bit over 15 yards of binding. I've been spending a lot of time working on my border for the next round robin that I have. Here is a bit of one of the blocks. Stay tuned for my continuous bias binding tutorial. I hope you are finding some time to stitch. I've just completed 50 rounds on my Giant Granny Square blanket. There are quite a few of us that have joined the crochet along over at Sucrette's blog. I plan to keep going on this blanket even though it is fairly large right now. In the next photo you can see how large it is compared to the size of the chair. It would already be a cozy wrap at this size. But there is still yarn left, so I will add a few more rounds. Those of you that know me are laughing because you know I always have a good stash of yarn!!! I'm going to try to come up with a pattern, chart or tutorial that will show how you do a granny square for those that want to make either this blanket or smaller granny squares. I'll post that over on my crochet blog soon. I hope you are having a good week and finding some time to stitch. You know that there is a lot of temptation out there in blog land. There is always something fun that you can be a part of or some new fabrics you can see (or buy) or a new quilting idea that you can try. Lately, I've been noticing all of the Garden Fence blocks on some of my favorite blogs. The blocks are all so different, and I can't stop looking at them. So I had a weak moment. I went over to McIntyre Girl's blog just to have a look around. She is hosting the quilt along. Then I decided maybe I would just make enough of these blocks for a table runner. I know you're laughing. How many times have you said that? I'll just make a few blocks-----just enough for a table runner or small wall hanging? Here's what I have done so far. These blocks finish at 10", and there are no seams to match. Honest! They go together very quickly and easily. I may need a bigger table at this rate. I'm using a Lovely layer cake by Moda that I've been saving for something special, and I thought the florals would be perfect for this project. I picked up 3 different shades of Kona Cotton to try out for the sashing. I have more fabric left so maybe I'll make just a few more blocks. The quilt along instructions use either a fat quarter or regular quarter of fabric, but the dimensions work for a layer cake. Thanks to Judy L. at Patchwork Times for hosting Design Wall Monday. Be sure to visit McIntyre Girl's blog. Besides being a quilter and hosting the Garden Fence quilt along, she just gave birth to her 3rd daughter. After looking at my cheddar and repro bow tie blocks that I've started cutting and sewing for my Leader and Ender project, I decided to make a few using some brighter fabrics. The brights are made from 2 1/2" squares/strips and will finish at 4 inches. Here are my cheddar bow ties. They finish at 3 inches. I kind of like both, but I'm still trying to finish some of my UFOs. I'm trying hard not to start too many new projects...even if they are going to be leader and ender projects. You only need to sew 5 seams to make one of these blocks so they go together pretty quickly. I have another finished quilt. This quilt is made from the Edyta Sitar pattern called Medallion. I hand applique'd the center and machine pieced the rest. I machine quilted this on my Bernina. I started out by echo quilting around the center applique'. Then I studied the quilts in Edyta's books Friendship Strips and Scraps and Friendship Triangles and many of her pieced quilts are quilted with an all over free motion quilting pattern. And, I can do a curvy line by machine much easier than I can do a straight line. For the inner border I did a free motion swirl, and on the outer border I just followed the design in the border print going around the teardrop design inside and along the outside edge and then through the stems and leaves. It is quilted and bound and ready for fall! I'm still working on machine quilting more of my UFOs, but in the evenings I have been crocheting. I joined the Giant Granny Crochet Along over at Le Monde de Sucrette's blog. We are all just making one giant granny square, and I think we are going to try to finish with somewhere between 50-75 rounds or until we run out of yarn. Here is a photo of my afghan. I have 20 rounds done so far, and I have only used each color once. I still have 5 more colors left that I haven't used. So if I have 25 different colors of yarn and could use each one 3 times then I would make it to 75 rounds for my blanket. I think it would be fun to make one of these in a planned color scheme....maybe I'll do that for my second one. I've started doing this CAL with some internet friends. Check out Elly's, Cattinka's and Cyn's blogs. There is also a Flickr group where we've posted photos. I hope you are finding some time to do some stitching or crocheting today. I'm still machine quilting, and I've just finished this table topper. I have several of this type of table topper to quilt. The patterns vary, but they are all similar. A few years ago this one was one of a series of patterns offered by Northcott. 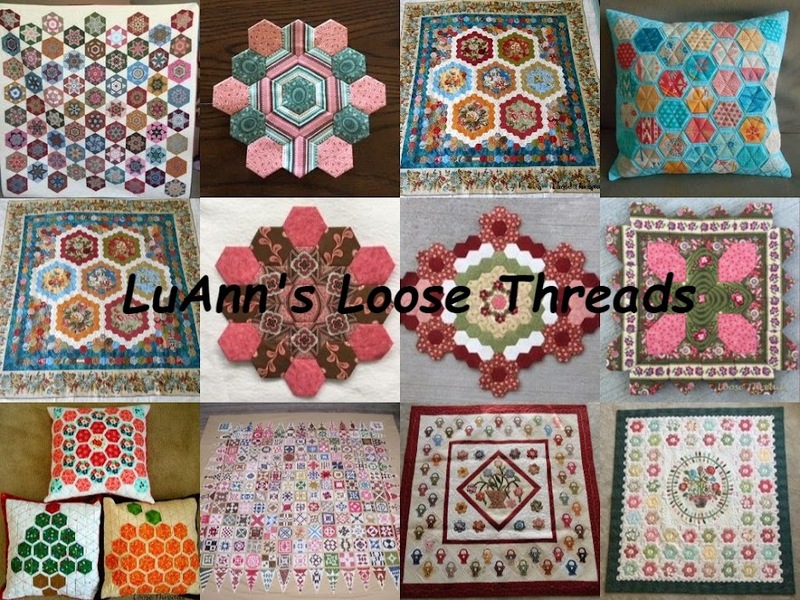 The patterns were available every month on their web site, and one of our local quilt shops sold the fabrics. Every month a friend and I made the trip to our quilt shop for our fabrics. After 7 or 8 months of not finishing these toppers, I decided that I probably had something in my stash that I could use along with the patterns. I really enjoy quilting these leaves in the border. I do this design quite a lot in my borders. And here it is all washed and crinkled. Thanks for stopping by for a visit, and welcome to my new followers!!!!! !